Take a behind-the-scenes look at the customized vehicles featured in the Batman television series! Features original cutaway artwork commissioned by Eaglemoss and approved by Warner Bros. and DC Entertainment. This 72-page paperback volume comes packaged with a 1/43 scale die-cast metal replica of the classic 1966 Batmobile in a diorama display of the Caped Crusader's subterranean crime lab the Batcave. 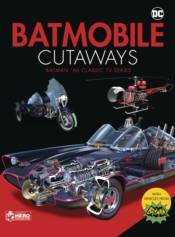 Includes every vehicle from the TV series - the Batmobile, Bat-cycle, Bat-copter, Bat-boat, and more. The cutaway artwork reveals the hidden details and gadgets of the Batmobile such as the Mobile Crime Computer, Bat-Ram, Batphone, afterburner, Detect-A-Scope, rocket launchers and 'bat turn' parachutes.